LONDON, Oct. 2, 2017 /PRNewswire/ -- International Game Technology PLC ("IGT") (NYSE: IGT) will unveil its Wheel of Fortune® 4D slots game today for the Global Gaming Expo (G2E) in Las Vegas, Nev. The technology-rich game pairs the most celebrated slot theme of all time with the immersive gaming experience of IGT's TRUE 4D™ product line. 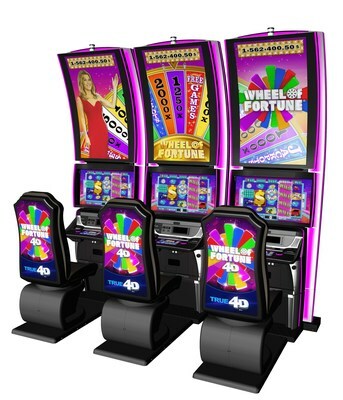 Wheel of Fortune 4D slots will complement the more than 400 other gaming solutions in IGT's G2E booth 3659. Through the use of TRUE 4D, gesture recognition and mid-air haptic technologies, the Wheel of Fortune 4D game offers players glasses-free 3D gaming entertainment and the ability to engage with the game's 3D graphics like never before. Gesture recognition technology enables players to interact with and manipulate the game's 3D objects, and mid-air haptic technology allows players to experience tactile feedback from the game's graphics. "G2E 2017 is the world debut for IGT's Wheel of Fortune 4D game on the CrystalCurve TRUE 4D cabinet," said Dallas Orchard, IGT Chief Product Officer, Gaming. "The game combines the player-favorite Wheel of Fortune theme with unprecedented technology and cutting-edge hardware to create a truly unique player experience. Many of our customers are anticipating the market arrival of IGT's SPHINX 4D game, which makes it even more exciting to announce additional TRUE 4D titles that they can leverage to differentiate their casino floors, and to engage a broad demographic of players." Wheel of Fortune 4D slots is a Wide Area Progressive (WAP) jackpot–eligible game that is housed on IGT's towering CrystalCurve™ TRUE 4D™ cabinet. The game incorporates iconic gameplay elements such as the millionaire-making "Wheel Bonus" with its signature "WHEEL-OF-FORTUNE!" chant, and the likeness of famed Wheel of Fortune TV personality Vanna White. Wheel of Fortune 4D introduces a bank-wide bonus event across the 50-inch, curved, ultra-HD upper displays of up to six banked cabinets to create one unified graphic of the Wheel of Fortune wheel. The player whose winning wager initiated the bonus can then spin the wheel and all Wheel of Fortune 4D players sitting at the bank will delight in a shared experience. The Wheel of Fortune 4D game will be joined in IGT's booth by the Company's other TRUE 4D titles including Ghostbusters™ 4D and the award-winning SPHINX 4D™ games. IGT launched Wheel of Fortune slots in 1996 and has since created more than 240 variations of the game that can be found in more than 20 countries worldwide. The theme has minted more than 1,000 millionaires and delivered more than $3 billion in jackpots throughout its history.